THE going is tough for our African representatives at the world’s biggest soccer jamboree taking place in Brazil. Five nations are representing the continent. Ivory Coast, Nigeria, Cameroon, Ghana and Algeria are our soccer ambassadors to the World Cup. Ivory Coast managed to get maximum points in the first round of matches while Nigeria managed to salvage a point from a goalless draw they played against Iran. Cameroon, Ghana and Algeria lost their openers. Cameroon who had refused to board a plane demanding to be paid by their soccer governing body lost 1-0 to Mexico. The West Africans were playing like in a protest. They had no sense of urgency even after Mexico’s goal. The ‘Indomitable Lions’ as Cameroon are affectionately known shocked many with the dismal performance. Captained by Samuel Eto’o, the West Africans demonstrated they have nothing to play for in the remaining matches. It was sad to see the current crop of the Indomitable Lions going down in a match they could have wrapped up if they played with conviction. The Cameroon powered by Patrick Mboma, Marc Vivien Foe, Rigobert Song and Modesta Mbami, among others would not have given such a poor show as recently witnessed in Brazil. While the team is in a tough group, it never showed the African fighting spirit like the Elephants of Ivory Coast who came from a goal down to collect three points in a Group C match against Japan. It was Ivory Coast’s coach Sabri Lamouchi’s introduction of Didier Drogba that turned the tables against the Japanese. The tactical substitution paid dividends as the former Chelsea man almost scored with his first touch. Wilfried Bony and Roma’s Gervinho scored the two crucial goals to ignite Africa into celebrations. Ivory Coast’s win in the first round of matches that saw 38 goals netted, boosts their chance of making it to the second round of matches. Their last group match will be against Greece. In the past World Cup finals, the Elephants of Ivory Coast have not reached the round of 16. Drogba who has been an inspirational forward for Ivory Coast, will be playing his last World Cup finals before he retires. The 36-year-old forward is effective with his stature, ability to shrug off challenge from defenders and his precision on goal. His retirement could be in style as he is likely to lead his team to greater heights. Nigeria broke the hearts of many as they failed to penetrate the Iran defence. While they are in a fair Group F comprising of Argentina, Bosnia-Herzegovina and Iran, the Super Eagles are yet to score their first World Cup goal. However, the goalless draw was better for the West Africans who will need a win and a draw to ensure they proceed to the knockout stage. Argentina and Bosnia-Herzegovina stand in their way. Chelsea midfielder John Obi Mikel, goalkeeper Victor Enyeama, defender Joseph Yobo and strikers Peter Odemwingie and Victor Moses are expected to deliver with their vast experience in the game. The reigning African champions first qualified for the World Cup finals in 1994 under the tutelage of Clemence Westerhof. Many will remember the historic finals in the USA when they beat Bulgaria and Greece in the group stages and qualified for the round of 16. Many will remember how Roberto Baggio’s equaliser cancelled Emmanuel Amunike’s 25th minute strike two minutes from fulltime. The game went into extra time and the Super Eagles lost. Italy later lost on penalties to Brazil with Baggio missing from the spot. Algeria are one of the continent’s soccer powerhouses. Although some Africans have reservations on the team that has a small following, the team failed to defend their early lead. The North Africans took a one-goal lead in the first half after Sofiane Feghouli converted a penalty kick. for 90 minutes as Belgium equalised before taking the lead. The match ended 2-1, denting Algeria’s hopes of the first World Cup victory. However, Algeria scored their first World Cup goal since 1986. The Desert Warriors, as Algeria are affectionately known, will need to win their remaining fixtures against South Korea and Russia. The Black Stars of Ghana were on the brink of breaking the African jinx to reach the semi-finals of the World Cup in 2010 in South Africa. Luck was not with the Black Stars’ as Uruguay beat them in the quarter finals after they had missed a penalty with the last kick of normal time. Ghana had for the past two World Cup finals met USA and defeated them. It was the third match the two met at the same platform, but it was the Americans who turned victorious. Group G is the so called group of death comprised of Portugal, Germany, Ghana and USA. Ghana’s chances of coming out alive from the group are now slim. The Black Stars will need to win the remaining matches against Germany and Portugal which is a tall order. However, the Black Stars are playing with conviction and look determined to give any team a run for their money. Although in a tough group, the West Africans are likely to go down fighting. 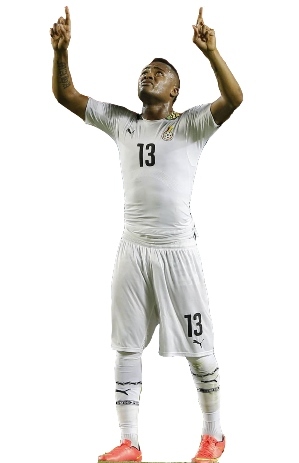 Captain Asamoah Gyan, Jordan Ayew, Michael Essien, Samuel Inkoom and Jonathan Mensah are some of the players making the nucleus of Ghana. The late goal Ghana conceded in the final stages of the game was a big blow to Africa as the continent was expecting yet another sterling performance from the West Africans. It now remains to be seen if African teams will fight in order to stay in the tournament. Being dismissed in the first round will be a bitter pill to swallow for all Africans.